This island walking holiday on Crete provides the best that the region has to offer. Discover isolated beaches, secluded coves and impressive canyons walking in the White Mountains and through the Samaria and Zaros Gorges. Arrive Chania and check-in at our hotel. Chania ia a beautiful old Venetian walled town, with a bustling harbour and lively tavernas - A great place to start your introduction to Crete. This morning we will take a walking tour around Chania. We will walk around the harbour and through the winding back streets, home to the traditional cobblers who make the very traditional Cretan leather boots. This afternoon we take a bus up the winding roads to the Omalos Plateau (1082m). This wild plateau is situated in the middle of the massive White Mountains, poised on the edge of a titanic split in the rock and the gateway to the longest and perhaps most beautiful ravine in Europe, the Samaria Gorge. The isolation of the plateau made it an historic refuge for Cretan revolutionaries against the Turks. Today's two kilometre walk is expected to take around one-and-a-half hours along a flat route. Today we walk through this spectacular gorge. To make the complete 15km descent to the fishing village of Agia Roumeli may take anywhere from 6 to 8 hours. We follow a steep zig-zag path, some 760m down into the gorge itself, past high cypress trees and many different alpine shrubs - and if we're very lucky, we may catch a glimpse of the wild Cretan Ibex (Kri Kri) leaping from ledge to ledge. In midsummer, the river dries to a trickle, but there are still stretches of water to be crossed with handy stepping stones. After walking for roughly 3 hours from the entrance at Xiliskalo, we stop at the now uninhabited village of Samaria, where the Venetian Church of Holy Mary with its old Byzantine mosaics and inscription over the front door can be seen. Now the gorge really starts to close in around us, and the river often disappears underground. After passing below the Church of Aphendis Christos, we hike through the narrowest part, the sidheroportes (the 'iron gates', only 4 metres wide, but over 350m high), and continue along the rocky riverbed into the small village of Agia Roumeli. Today we take a beautiful walk along the coast, following the well marked cliff path we walk through pine woods, passing by secluded beaches. At Ayios Pavlos we will see on old chapel situated on a ledge above the water, built on the spot that Saint Paul is said to have first arrived at in Crete. Inside the somewhat crumbling facade are frescos dating to the thirteenth century. For those who would prefer not to walk today there is the option to have a relaxing morning in Roumeli and then take the ferry to Loutro (not included). Today's 15 kilometre walk is expected to take around five-and-a-half hours with 275 metres of ascent and descent. This quaint seashore village, perched on craggy rocks and nestled in a cove, affords an opportunity to experience life in a less accessible part of the island. Most houses are the very traditional white with blue shutters providing a harmony of architecture. We'll spend the day here, perhaps taking a walk along the coast or inland, swimming or simply relaxing. An optional boat trip by water taxi can often be arranged to Marmara or Finix beach. Alternatively, you may prefer something more active such as a full day or half day walk behind the village, up to the historic village of Anopolis or perhaps down the Aradena Gorge enjoying spectacular views of the coast en route. In the evening you may care to try the delicious fresh seafood caught by local fishermen. 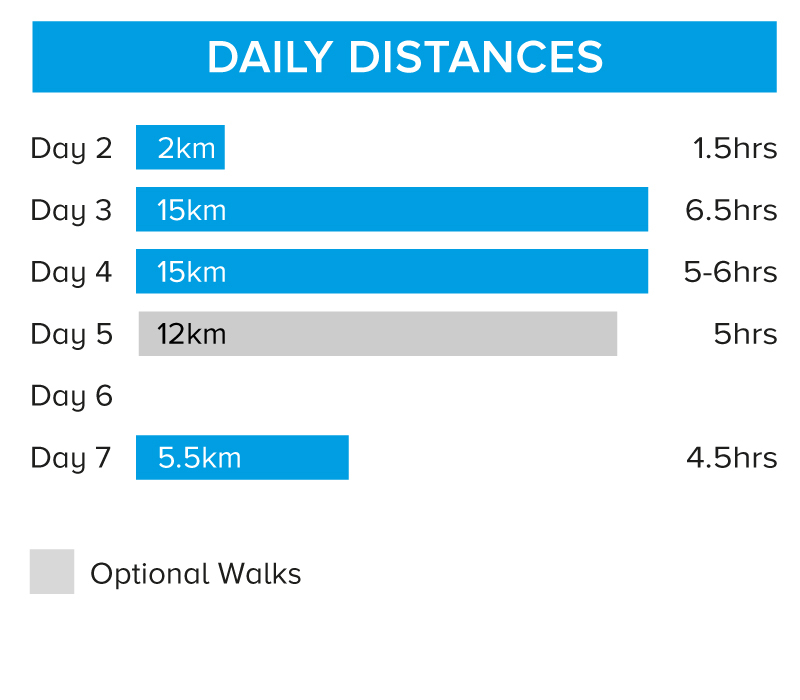 Today's optional 12 kilometre walk is expected to take around five hours. 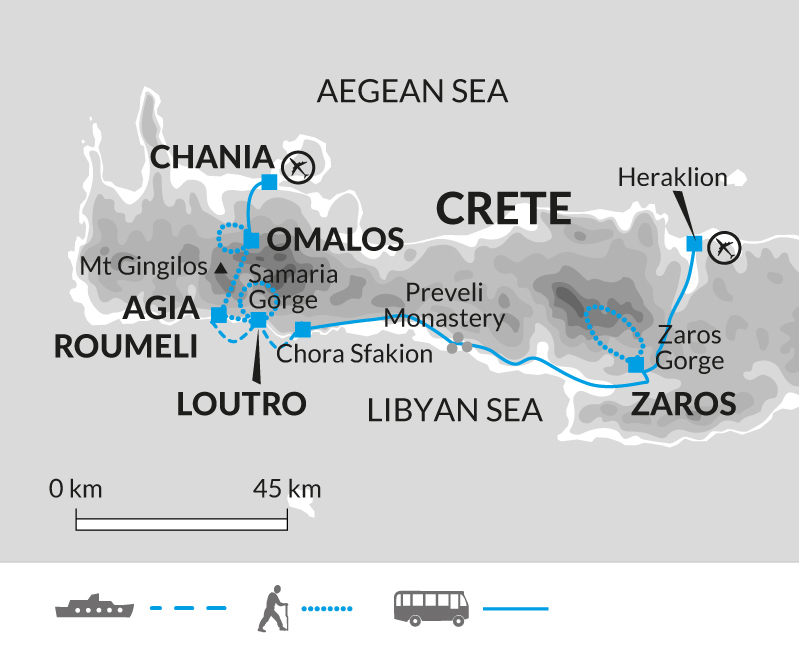 Today we get the ferry along the coast to Chora Sfakion. A pleasant coastal village with a few hundred inhabitants and an old reputation as a lair of brigands, smugglers and pirates. The Sfakians cherish their independence and see themsleves as Sfakians first, Cretans second and Greeks third! As a rallying point for revolutionaries, there are many sea caves in the area which were used as great hiding places during disputes. We then journey by bus to Zaros in the rugged Idi Mountains. We'll pause en route at Preveli cliff-top monastery. Perched high above the sea, its fame was capped in World War Two when the monks sheltered allied troops who were stranded on the island after the Battle of Crete and helped them to escape from the beaches nearby. The views from here are magnificent. We also break the journey for a short while in the pretty Greek village of Spili . We plan to arrive in the village of Zaros in the early evening. Deep in the heart of Crete are the Idi Mountains This region is very scenic and is particularly noted for its spring waters, which are bottled and sold throughout the island. Our primary reason for visiting Zaros is to walk in the surrounding mountains, and we set off after breakfast to explore the dramatic Rouvas Gorge. Local vehicles take us to a steep rough track from where we'll descend the dramatic 5km long gorge on foot enjoying spectacular views of the Psiloritis range as we go. The afternoon is left free for you to explore the surrounding area. Located in a peaceful setting overlooking the Koutsoulidi valley, this is an ideal spot to relax. Today's five-and-a-half kilometre walk is expected to take around four-and-a-half hours with 540 metres of descent. We leave Zaros today to drive to Heraklion airport where trip ends. Although entirely voluntary, tipping is a recognised part of life in this region of the world. Some local staff will look to members of the group for personal recognition of particular services provided. In order to make things easier for you, the Explore Leader may organise a group's tips kitty and if this is the case, they will account for it throughout the trip. Walks on 4 days for between 1.5 and 6.5 hours each day. Trails are quite rocky with some occasional short, steep ascents. This island walking holiday on Crete provides the best that the region has to offer; dramatic gorges, beautiful coastlines, scenic traditional villages and welcoming Cretan hospitality.